hmm. where do I start. once upon a time a long time ago in a place far far away there was a limited production Leica M3 made just for Professionals. Brilliantly, it was called the Leica MP. The year was 1956. Only about 450 were made. Today one in nice shape is likely to cost more than most recent used cars. It had a M2 style advance counter and M2 style take up spool, and came complete with a Leicavit bottom mounted trigger advance. The Leicavit attached to the bottom of the MP and allowed fast left handed lever film advance, with practice up to about 2 1/2 fps. Part of the special MP appeal is that Leicavits would not fit standard M3's, only the MP, M2, M1, and MD. Today M Leicavits are very rare and far between, much rarer than the earlier screw mount Leicavits. Even if you can find one, many are worn out and broken. And so, brave Leica M photogs waited roughly forty years for an easily obtainable M Leicavit. 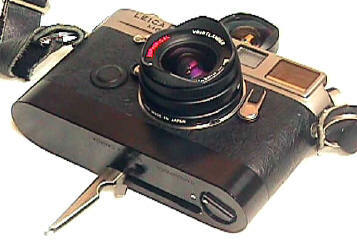 Alas, father Leica discontinued the Leicavit MP in 1966. A new generation Leicavit MP was introduced at the 2003 PMA show in Las Vegas, complete with its minimum advertised price of $995. Leica did not seem close to making a new Leicavit M, so Tom Abrahamsson entered the picture (OK, so I love cheap puns.) Tom has been making them since 1989 in his one employee 600 sq. foot Vancouver machine shop. There aren't too many of them around, roughly 3000, give or take a lever wind here and there. In other words, there are only about 3000 Rapidwinders available for over 150,000 M4-2, M4-P, M6, and M6 TTL cameras. 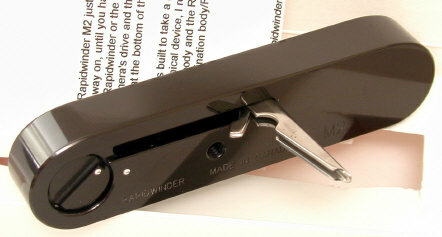 In fact, I had never seen one in the flesh, or in the lever, until I found a used Rapidwinder. Once I got it home and attached it to my trusty M6, I was surprised how rough it was and how loud its return spring was. A few emails later, Tom confirmed that indeed, there was a problem, and to ship it off for exploratory surgery. I did, and about two weeks later it arrived back home, all fixed and upgraded to a chrome lever wind. I was astonished that Tom did the repairs for free, even though I was not the original buyer. He explained this as his standard policy on ailing Rapidwinders. Too bad camera manufacturer's don't share his viewpoint. 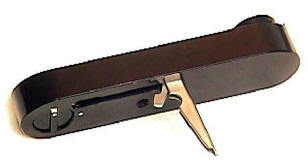 The M6 Rapidwinder replaces the baseplate on your M6 , M7, MP 2003 (or M4-2, or M4-P). 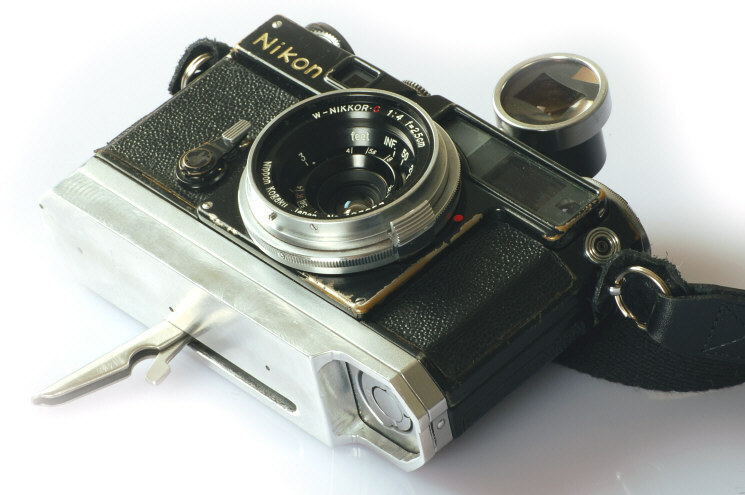 The photog then has the option of the bottom mounted trigger wind or the standard top mounted lever advance. In use, you have the left hand holding the camera and controlling the Rapidwinder advance, the right hand steadies the camera and releases the shutter. With practice, about 2 to 2 1/2 frames per second are possible. 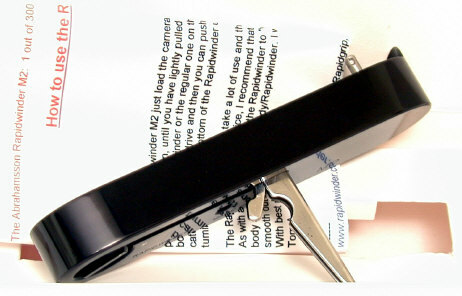 The Rapidwinder's action is smooth, quite in keeping to its Leica heritage. If you are like me, you have run out of hands at this point --- which means you can't refocus if necessary and still operate the Rapidwinder. This means the Rapidwinder is best used for a) non moving subjects b) wide angles and moving subjects where the depth of field will take care of the focus shifts c) moving subjects with teles at medium and infinity distances with medium and small f/stops to carry the depth of field) d) NOT wide open apertures and moving subject with focal lengths of 50 or longer. To be fair, these limitations just don't apply to the Rapidwinder, but also to the Leicavit and the trigger wind Canon rangefinders. Compared to the various M6 motors, the Rapidwinder is much smaller, lighter, quieter, more reliable, and even costs less -- and it needs no batteries. Aesthetically the Rapidwinder is a better mate to the M6 body than the M motor. Tom was able to simplify internal design for increased reliability while using modern aerospace alloys and stainless steel construction. Few people seem to really like the M6 motor due to its weight, bulk, loud un-Leica like noise. On top of all of that it has the disconcerting habit of pumping the shutter release up and down. To put it another way, when a list of Leica's best designs is made, you will not likely find the any M6 motor on it. Another advantage, of either the Rapidwinder or the M6 Motor, is left eyed photography. All Leica rangefinders are designed for right eyed photogs. If you find yourself left eyed, you will also find the advance lever sticking you in the forehead all the time. I've read various people describe the Rapidwinder as silent. Well, mine's not. I write this comment not as a complaint, it's just I don't understand it being described as silent. You still have the sound of the film advance and shutter after all. All that being said, I find the Rapidwinder's unlabeled simple bottom lock out of place. A M6 locking lug would be a much better match to me. Leica has looked at the Rapidwinder, coming to the conclusion they can neither improve it or produce it nearly so inexpensively. It is the only major non Leica manufactured accessory which is arguably made as well as the Leica M. Rapidwinder aficionados LOVE their Rapidwinders, many refusing to use their M's without it. Pride of ownership is just as devoted to the Rapidwinder, as the camera they are mounted on. In 2003 Leica did make a new version of its Leicavit MP, at twice the price of Tom's. Personally I believe Tom's Rapidwinder will prove more reliable as the new Leicavit has a more complicated internal design. Some users appreciate the Rapidwinder's aesthetic and historic MP heritage, somehow helping the photog feel closer to the likes of Eugene Smith, Capa, Eisenstadt and David Douglas Duncan. From 1960 to 1966 Leica produced an estimated 2-3,000 bottom trigger wind Leicavit MP's for the Leica M1 and M2. Today they are sought after collectibles often bringing upwards of $3,000 in nice shape. Unfortunately many no longer work due to a lack of repair parts. There are over 80,000 M2's, yet there may be less than 1000 working Leicavit MP's and M2 Rapidwinders. 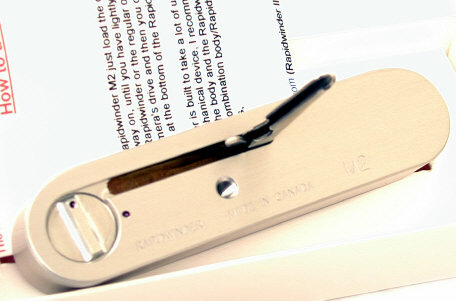 Note that the neither the M6 Rapidwinder, nor the new 2003 issue Leicavit MP will fit the M2. 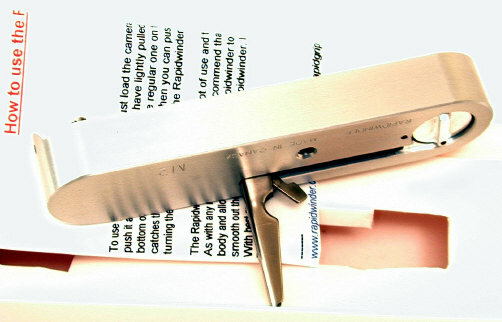 Tom produced a limited edition of 300 M2 Rapidwinders. Only 40 of the 300 sold were Black Paint, the rest silver. They are now discontinued and sold out. IF you look closely at the instruction heading in red, you will see "1 out of 300." In early 2003 Tom started production of his Barnack Rapidwinders for the Leica IIIc/IIIf/IIIg. Tom Abrahamsson's Rapidwinder has a unique place in the Leica M world. It is the only major non Leica manufactured Leica M accessory in current production, thereby filling an important void in the M lineup. Revised: January 10, 2017. Copyright � 2002-9 Stephen Gandy. All rights reserved. This means you may NOT copy and re-use the text or the pictures in ANY other internet or printed publication of ANY kind. Information in this document is subject to change without notice. Other products and companies referred to herein are trademarks or registered trademarks of their respective companies or mark holders.